‘It could be this year’s Atlantis!’ squeals someone in the office as we consider the rumours raging about the opening of the first-ever Armani Hotel, here in the Burj Khalifa. But we don’t mean that the godfather of fashion’s debut into the world of hospitality will resemble the Plato-inspired mega-hotel. Oh no – we’re talking about the sheer scale of the opening ceremony. Surely it will be another Gatsby-esque swirl of glorious hedonism, with fireworks, star DJs, scandalous strops and AAA-list celebrities at every turn? Rumours that Beyoncé, Victoria Beckham and current Armani ‘face’ Megan Fox are all to attend have fluttered across Twitter for days, anticipation mushrooming like the great ash cloud that has set the date back a week. Getting onto the guestlist involves no small feat: police checks, photos and increasingly shameless calls and emails. And when we finally arrive for the party? ‘We did have five big “names” booked to attend,’ Armani’s right-hand man tells us on the dancefloor. ‘But we cancelled them all at the last minute. We wanted tonight to be all about Mr Armani and the hotel he’s been working on for the past five years – not the actresses who simply arrive and have their picture taken at the party.’ ‘Of course,’ we nod, while our inner namedropping alter-ego starts to weep (even spotting Dennis Wise amid the crowd doesn’t stop the tears). But the enterprising silver-haired tailor is certainly centre of attention at the hotel’s first press conference. Dressed in a simple blue T-shirt and white trousers (looking tanned as ever), he calmly responds to the questions of the frenzied media in front of and slowly surrounding him – the first enquiry, of course, being: why build your first hotel in Dubai? ‘When Mohamed Alabbar [chairman of Emaar Properties] came to my office to talk about this project, I couldn’t believe it,’ he explains. ‘At the time, Dubai was described as being like Las Vegas. I asked him very directly, “Why Armani? Are you really sure you want me?” I really prize minimalism and think less is more, preferring to take out rather than add in – when I looked at what was happening here, it seemed to be exactly the opposite,’ he continues, perhaps referring to the world’s tallest tower, in which he’s sitting. ‘In short, he wanted me and I happened to want him, too. Together we decided to create… something for beyond the present,’ he finishes with a quintessential Dubai big claim. So, is the 10-floor venue as memorable as they hoped? Walking through the first tour, the verdict seems to be that it’s all ‘very Armani’: slick and sophisticated. 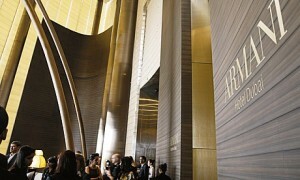 Never veering far from a palette of browns, nudes and neutrals, each space feels relaxed, as though Armani has consciously attempted to impress in the least ‘Dubai’ way possible: with subtlety rather than showiness. Of the six restaurants, those that stand out are Hashi, Amal and Peck, his Japanese, Indian and Italian restaurants (the latter was originally a 19th-century salami shop, now with a clandestine pork room). Elsewhere, the boutique 400-capacity Club Privé is super-chic, while the exclusive spa seems shrouded in mystery (you book a ‘time slot’ rather than a treatment; therapists then design a tailor-made therapy for you, including Giorgio’s personal favourites). And the rooms? The cheapest, from Dhs4,000 a night, is relatively small, but boasts sea and city views as well as a remote control to handle every aspect of your stay, from opening the blinds to calling your ‘lifestyle manager’ – the member of staff allocated to meet (almost) your every whim. 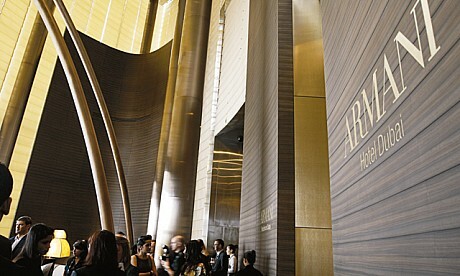 ‘It occurred to me that I’ve never really enjoyed staying in hotels,’ Armani tells us later. ‘They often have decor that I don’t like and don’t always have the level of service I’d expect from a luxury establishment. I wanted to give my customers an experience similar to that of being house guests in my own home.’ At the party, it’s clear he’s satisfied with the result. After being papped with almost every guest, he hits the dancefloor before hanging out in the DJ booth until the place begins to empty. According to his assistant, he does the same in his Milan club every Wednesday and Thursday night. His alleged secret? Sticking to just one alcoholic drink a day. The following morning the 76-year-old remains spritely. Walking back to the towering skyscraper to catch his private jet to Milan, he momentarily stops in the midday sun to marvel. ‘It’s the best, no?’ he says to no one in particular, speaking English for the first time on his trip. His tone is quietly satisfied, not a little like the Armani brand itself. With a label that confident, who needs fireworks?